Aokigahara Jukai (青木ヶ原樹海), also known as Fuji sea of forest, is the biggest and the only forest made top on lava in Japan. 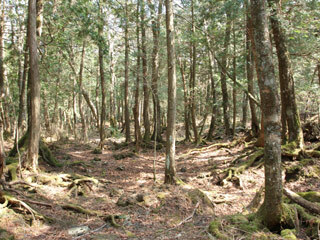 Because its unique environment, Aokigahara Jukai has very unique Ecosystem. Most of trees of Jukai are over 200 years old, and they cover the field of lava. Aokigahara Jukai is the most popular suicid spot in Japan. Because legend said, once you lost in Jukai, nobody will find you. However, this legend is based on the novel, and Jukai has many hiking courses and many people visit here for weekend hiking. Jukai spread wide, so there are many hiking courses. However, because it is made top on lava, out side of the courses are very rough and dangerous. So, when you enjoy hiking, stay in the course. 1. use local bus to either Lake Sai, or Lake Shoji.